Who the Hell is Miguel Ibarra? Jurgen Klinsmann is no stranger to USMNT roster controversies. As we know, he left the greatest player in USMNT history off of the World Cup roster in June. He also called up the first college player to suit up for the USMNT in 15 years for September’s friendly against the Ukraine. What did Jurgen decide to do this time around against Ecuador? How about bringing in a guy who isn’t playing in a top division in his own country? Let’s meet Miguel Ibarra of the North American Soccer League’s Minnesota United FC–Klinsmann’s latest call up. OK, so it’s not as if they pulled a Tony Bravo off the streets (or the DEA/CIA, as is the case on the El Rey Network’s Matador). Ibarra was a standout at Taft College and UC Irvine from 2008-2011, and was even named Central Valley Conference MVP while at Taft, and Big West Co-Offensive Player of the Year in 2011 for Irvine. 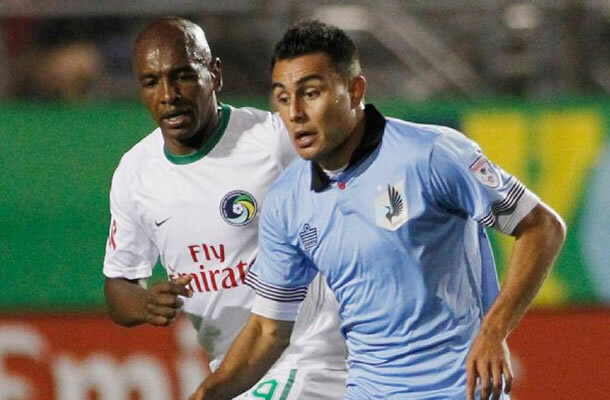 After his time at the University level, Ibarra was drafted by the Portland Timbers in the second round of the 2012 MLS Supplemental Draft, but unfortunately, didn’t make the team. In March of that year, he signed with Minnesota. That’s it. That’s really Ibarra’s entire career. He has been a great for Minnesota so far this season, but as highly regarded as MU is in the NASL, they’re still a second division club. Success at the NASL level does not even come close to guaranteeing success at even MLS (as Ibarra can attest to), let alone at the international level. Some could call this move by Klinsmann crazy. Sure, Jordan Morris was just a college kid when he got the call in September, but you can tell when a kid’s going to be special when he’s college aged. Ibarra is almost 25. Some would argue that he’s reached his fullest potential, and that potential isn’t even good enough for MLS. I, for one, think it’s a great move by Klinsmann. Not only is he leaving no stone unturned in his search to field the best team he possibly can, he’s also sending a more subtle version of the message he sent with Donovan’s exclusion from Brazil–the current motus operandai in American soccer is not working. Just bringing in the biggest names and handing them roster spots simply isn’t going to cut it. America needs to bring in guys like Ibarra and Morris, and exclude guys like Donovan, to make sure we are finding all of the available talent out there, and keeping our more established players motivated and looking over their shoulders a little bit. Kudos to Jurgen on this one, and congratulations to Miguel Ibarra. At the very least, this should put him back on the MLS radar.